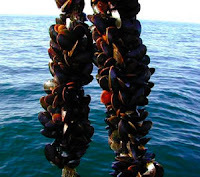 I love mussels and they are so cheap. ($6.90 / kg at Angelakis in the central market). 1 kg mussels in shells serves 2 - 3 people. To serve more I buy some mussel meat, rather than more in shells or you get too big a volume to cook in a pan. Into a large pan put the first 8 ingredients and bring to a boil. Stir to combine. Add mussels, cover, reduce heat to a simmer, and cook 5 minutes or until all the shells are open. Add the herbs to the liquid and cover for 1 minute more. Serve on rice or (I prefer) organic buckwheat noodles, so it is almost like a soup. Cook pasta, drain, tossin the oil and parsley. Meanwhile, place pasta sauce, white wine and chilli in a large pan and bring to the boil. Add mussels, cover and simmer 5 minutes or until shells are all open. Serve pasta, top with mussels and liquid. Don't forget to wear a red shirt while eating! Melt butter in a large pan. Add onion, celery, pepper, wine and mussels. Cover and simmer 5 minutes until the shells are open. Remove mussels from the pan and reduce liqid to 1/2 cup. Remove from heat and stir in cream, yoghurt and parsley. May reheat gently but do not boil. Serve with rice or other. Kate thanks for the comment. I've added your blog to my löinks section. Can you do the same? btw we bought our house from a German guy who emigrated to Queensland. ...and, isnt Oz the home of Permaculture by Bill Mollison? I am interested in that subject but have yet a lot to learn before I can get into it.